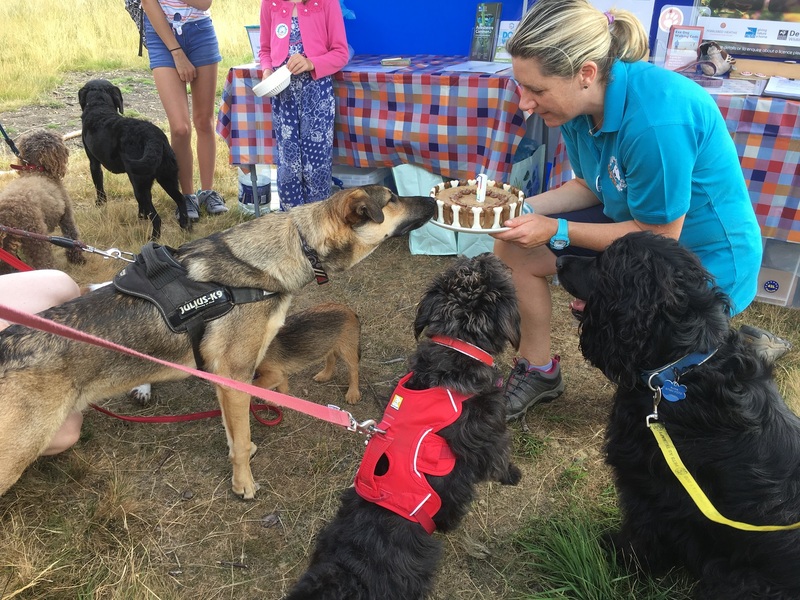 More than 15 local dogs celebrated Devon Loves Dogs’ first birthday on Saturday, with prizes, games and treats for dogs, as well as a specially-made dog birthday cake. Devon Loves Dogs joined forces with Pebblebed Heaths Conservation Trust to take dogs and their owners on a guided, waggy walk around the Pebblebed Heaths to learn about the special wildlife there. At the end of the walk the dog owners enjoyed breakfast, while the dogs enjoyed eating a cake made of dog-friendly ingredients. The dogs went on to enjoy playing games like ‘fetch’, the best trick and sleeping lions, with prizes for the winners. “It was a brilliant first birthday gathering for lots of our dog members. People join Devon loves dogs because they want to be part of a group of people who love their dogs, love where we live and want to help care for it by being a responsible dog owner. “We had so much fun. It’s really good for Daisy to socialise with other dogs, because she has a tendency to be nervous and bark, so going on the walk helped her make lots of new friends! “Daisy really enjoyed the cake and we were very lucky to win a dicky bag. It clips on to a belt or coat and you can put any doggy deposits in it while you are out on your walk. It means you don’t have to carry a smelly bag around with you until you see a dog bin. Devon Loves Dogs is funded by South East Devon Habitat Regulations Executive Committee – a partnership of East Devon, Exeter and Teignbridge Councils.